Click on the Upload icon in the top left corner of the main Pics.io screen. It's situated right under the yellow Pics.io logo. To upload new assets to Pics.io, select them from your device or simply drag'n'drop them to the screen. You may also upload files to the definite collection by clicking on the "Upload" button next to the collection name as it is shown on the screenshot below. The assets will be added to a collection which is selected at the moment. We strongly recommend to store your assets in collections to keep things organized. As you upload your assets you can attach keywords to make them more searchable. You can select numerous assets for to be uploaded to Pics.io. However, in case of slow internet connection, you'd better stick to uploading one asset at a time. It is also possible to upload the whole folder (or multiple folders) with files from your device to Pics.io. All the structure will be the same as in your folder. New subcollections will be created. Then you may rename the subcollection if necessary. After uploading of the files starts, you can track the progress of uploading in the “Upload” menu on the left-side panel. If there are a lot of assets to be uploaded, you may minimize the Upload window to continue working with Pics.io meanwhile. Uploading assets to lightboards has some peculiarities. Please find more info about them here. Pics.io works on top of Google Drive (or Team Drive). So you may upload assets to your Google Drive folder that you connected with Pics.io and then synchronize them with Pics.io. Btw, we recommend you to check our recently compiled Complete Guide to Uploading your Files to Google Drive, where you can learn about a variety of ways how you can add your files to Google Drive. We hope it may help you a lot. What if I have issues with uploading assets to my Pics.io library? If you have any issues with uploading new files to your Pics.io library, please make sure you have no plugins (like Adblock or uBlock) added to your browser. In case you have such, please disable these extensions and try again. If the issue still persists, please contact us at support@pics.io or via chat with more details for further investigation of the problem. What happens when I upload my assets to Pics.io? Attach keywords - you may want to describe your newly uploaded asset with the help of keywords. You can either choose them from the dropdown menu of the available keywords or create a new keyword right on the spot. It is also possible to copy/paste keywords for your assets right on the Import panel. You can learn more about keywords here. Assign users - you may want to assign the newly uploaded asset to some particular member of your team. The list of users assigned to the asset can be found in the Infopanel. Leave comments - you may decide to tell your teammates something about the newly uploaded asset. The comment with appear in the Activity panel. Depending on the team policy, you may be required to leave a comment every time you upload a new asset or revision. 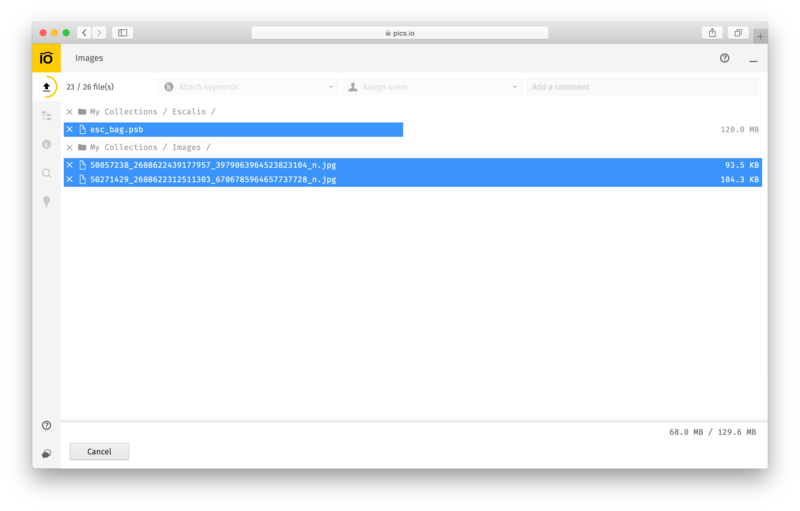 Moreover, every time you upload an asset to Pics.io, the service captures all the available metadata and keywords that may have already been stored inside the asset. They are captured and saved in the corresponding fields. Some file formats have special requirements before uploading to your Pics.io account. - save the settings and restart the program. After these changes, InDesign will automatically create previews for files.